Untitled (Angel), 2008, mixed media, 115 x 25 x 8". This spare exhibition presents three works, one by each artist and a third made collaboratively, by Berlin-based artists Mirjam Thomann and Jan Timme. By leaving the gallery nearly empty, the artists give the works room to question more forcefully the architectural and conceptual implications of their exhibition space. Thomann’s Untitled (Couple) (all works 2008) consists of two plywood screens suspended halfway to the ceiling and installed in the gallery’s corners. Painted in black and white, they seem constructed to hide certain architectural features or to offer refuge to visitors. Their lightness, however, makes them easy to miss, almost like architectural details—albeit ones that look like geometric protuberances—of the gallery itself. Timme also plays with the space by printing backwards, across the walls and ceiling, a German phrase that translates as “Phenomenology of Perception.” As in a complicated anamorphosis, one can read the phrase in its entirety only by standing in a specific place in the gallery and with the help of the mirror leaning against a wall. 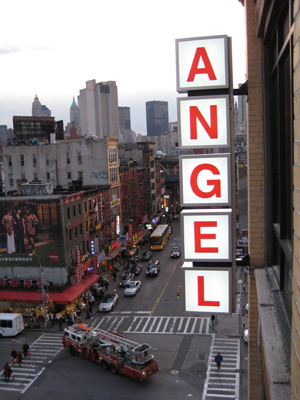 Thomann and Timme collaborated on Untitled (Angel), a street sign that hangs outside the gallery window and features the word ANGEL. An anagram for “Nagel,” the surname of the artists’ Berlin dealer (who rented the gallery for this show) but also, more immediately, a reference to the many signs that dot the neighboring Chinatown buildings, this work adds a sense of nostalgia to the whole show, by evoking strategies of displacement that were so dear to a group of artists working with institutional critique who exhibited with Nagel in the 1990s.